Rothberg International School offers Thrive as an extracurricular, immersive program that will enable you to gain an in-depth and sophisticated appreciation of Israel. Thrive offers VIP activities all over Israel, Shabbat and holiday home hospitality (including placements in different communities), and exploratory discussions on Jewish thought. Our caring staff will treat you like family and assist in fulfilling all of your personal interests while abroad. Thrive is your custom-made Israel experience. We guarantee that you’ll have the best semester abroad of your life. Learn more about Thrive here! 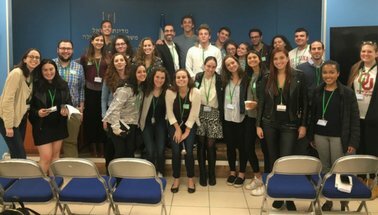 Thrive students participate in the Undergraduate Study Abroad Program at HebrewU’s RIS and must meet all of its requirements. This program consists of an intensive pre-semester Hebrew language course or ulpan (5 credits), and a semester course load of 15 credits, made up of Hebrew-language study and courses in Jewish, Israel, and Middle East studies; psychology; business; and law.